As you might expect, Tahiti and the islands of French Polynesia are tropical gems. This map shows the Society Islands, the part of French Polynesia we visited. We only got to visit 4 of the 130 total islands. Life is just too short! Our 2-week visit was divided among first class and intermediate price hotels, between the well known and the out of the way. We started off at the Beachcomber Park Royal in Tahiti. It's a 4-star hotel and has everything one could want, except a sandy beach to walk on. It has ambiance without extravagance, open air dining and an enormous swimming pool, the shallow and deep areas glimmering in light and dark blues. Behind the pool is an inlet, bungalows and then the lagoon. This sunset photo of the inlet was taken from the pool area. We stayed here two nights at the beginning of our trip and one at the end. 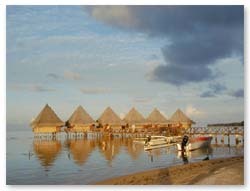 The island of Tahiti has the only real "city" in the islands, Papeete. The cars hustle by and just crossing the street is an adventure, even at the crosswalks. Compact cars and Le Truck, the local bus, form an endless parade on the narrow streets and park haphazardly in every available nook or cranny. The morning after our 2 A.M. arrival, we breakfasted in town French style -- buttery chocolate croissants, mini-quiche and croque monsieur accompanied by rich, chocolaty cappuccino. This not-so-petite dejeuner fortified us for a couple of hours of exploration highlighted by a stroll through the local marketplace, a bustling two-level structure jammed with vendors of baskets, trinkets, tropical fruit, pastries, and stunning flowers, leis and garlands. We then figured out where to spend the next two weeks. Advice from our guidebook plus discussions in the helpful tourist bureau led us to the Air Tahiti office. 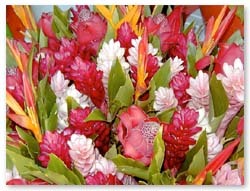 We arranged a customized package with air, hotel and ground transfers that would allow us to sample the islands. Our first stop, we spent four days in Huahine (WHO ah HEE nay), a very quiet island where a simple lifestyle rules. This low-key beginning was the perfect way to wind down from our whirlwind circumnavigation of the U.S.
Next we flew to Bora Bora. There we luxuriated for four days at the Hotel Bora Bora, known as one of the world's most romantic hotels. A real treat. Our final destination was Moorea and the Hotel Bali Hai, where we got an up close look at underwater life in the lagoon. Over-water bungalows like these were ubiquitous in the islands. You can swim off your private deck, if you're willing to ante up for the privilege. 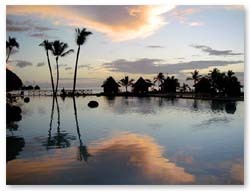 Should you plan to French Polynesia, don't forget to check out our money saving tips. Paradise is not cheap. Text and Photography by Witta Priester and Richard Baughn. Copyright © 1999-2000 Witta Priester and Richard Baughn.